In this paper, the problem of magnetohydrodynamic (MHD) flow of a viscous fluid on a nonlinear porous shrinking sheet is studied. The boundary layer partial differential equations are first transformed into an ordinary differential equation, which is then solved numerically by the shooting method. The features of the flow for various governing parameters are presented and discussed in detail. It is found that dual solutions only exist for positive values of the controlling parameter. Boundary layer flow over a stretching sheet has been studied in various aspects since the pioneering work done by Sakiadis . Lately, many researchers have studied the shrinking sheet boundary layer flow problem due to its important applications in industries which involve packaging process, for example, shrink wrapping. The study on shrinking sheet was first initiated by Wang  by considering the stretching deceleration surface. 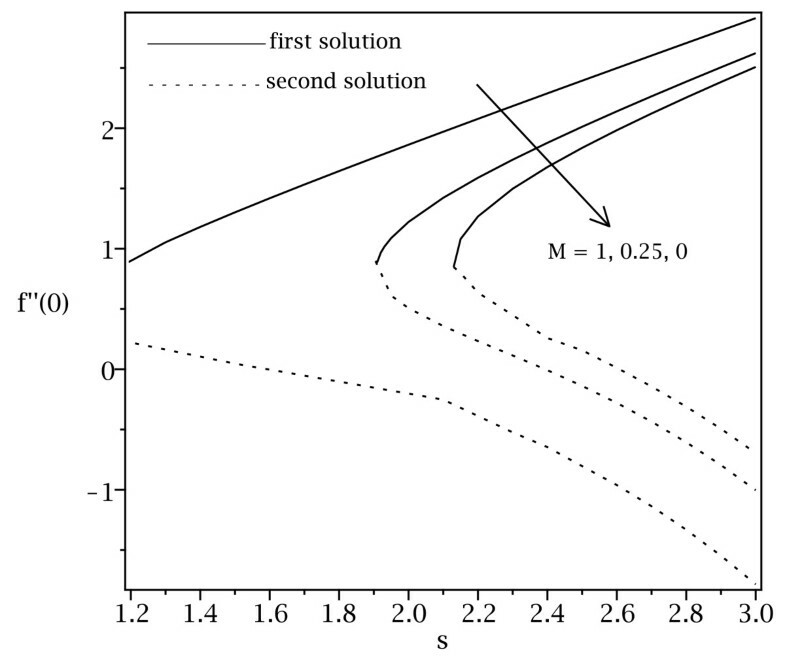 Miklavcic and Wang  proved the existence and uniqueness for viscous flow due to a shrinking sheet, and dual solutions were reported for certain range of the suction parameter. Later, Wang  also studied the stagnation flow towards a shrinking sheet by considering the two-dimensional and axisymmetric stagnation flows, and dual solutions were also reported only for the two-dimensional case. Further, Sajid et al. and Hayat et al. considered the rotating flow over a shrinking surface. The steady boundary layer flow problems induced by a shrinking sheet can be found in [7–11] in different aspects. On the other hand, the unsteady case is described in papers by Fang et al. and Ali et al. [13, 14]. It is worth mentioning that dual solutions are also found in the papers by Fang , Fang et al. and Ali et al.. Recently, Nadeem and Hussain  solved analytically the problem of magnetohydrodynamic (MHD) flow of a viscous fluid on a nonlinear porous shrinking sheet using the homotopy analysis method and dual solutions were not reported. 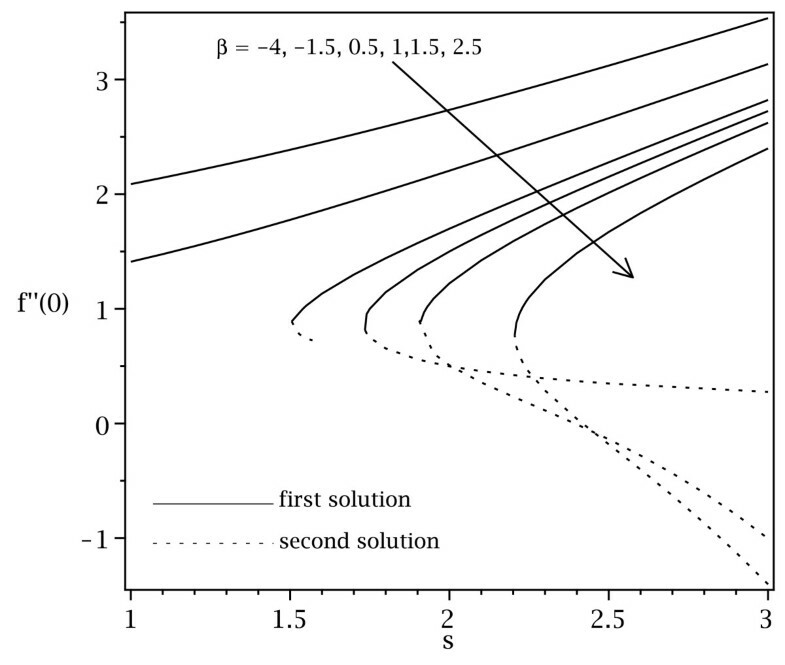 Hence, the present paper aims to obtain the dual solutions numerically for the problem considered in Nadeem and Hussain  for various controlling parameters and magnetic parameters. B ( x ) = B 0 x ( n − 1 ) / 2 .
are the wall mass transfer (suction) parameter, the magnetic parameter and the non-dimensional (controlling) parameter, respectively. where R e x = u w x / ν is the local Reynolds number. Equation (6) subject to the boundary conditions (7) has been solved numerically using the shooting method as described in the paper by Meade et al.. This technique is an iterative algorithm which attempts to identify appropriate initial conditions for a related initial value problem (IVP) that provides the solution to the original boundary value problem (BVP). The results of the skin friction coefficient f ″ ( 0 ) obtained in this study are compared with those of Nadeem and Hussain , as displayed in Table 1. The agreement between these results is very good. Therefore, we are confident that the present method is accurate. 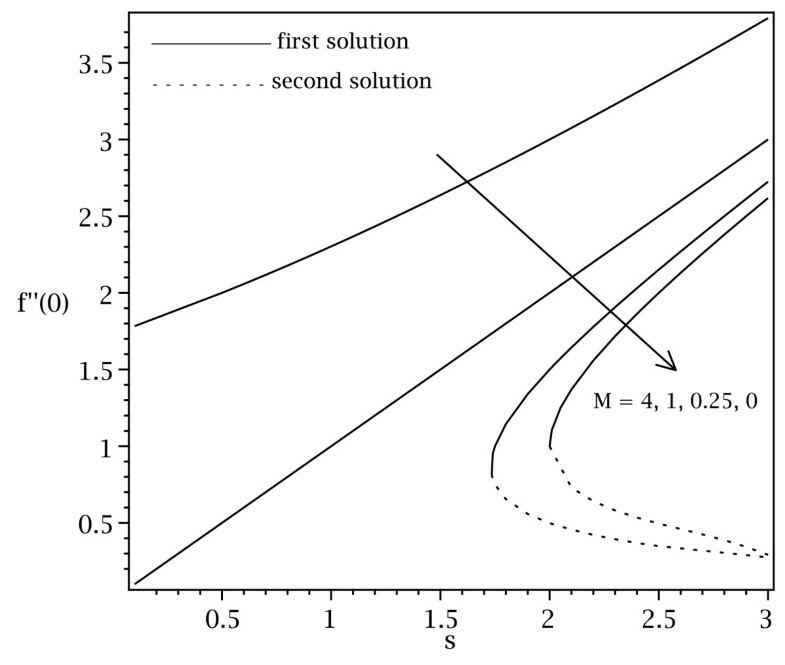 Figure 1 shows the variations of the skin friction coefficient f ″ ( 0 ) with the wall mass transfer (suction) parameter s for different values of the controlling parameter β. Dual solutions are found to exist only for positive values of β. It is also found that f ″ ( 0 ) decreases with β. On the other hand, the skin friction coefficient f ″ ( 0 ) increases with s. This is because, physically, suction produces more resistance to the transport phenomena. 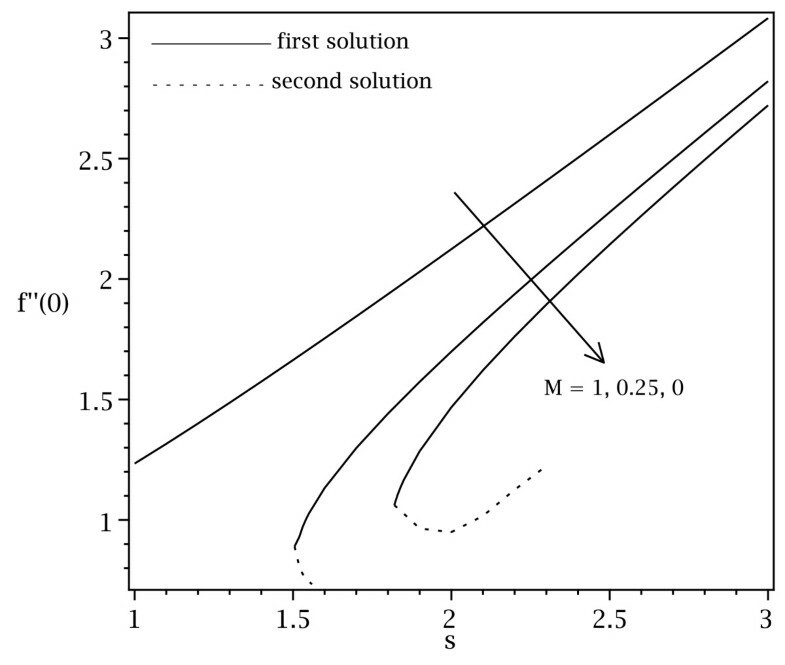 The critical value of the suction parameter s c decreases as β increases; therefore, the controlling parameter accelerates the boundary layer separation. 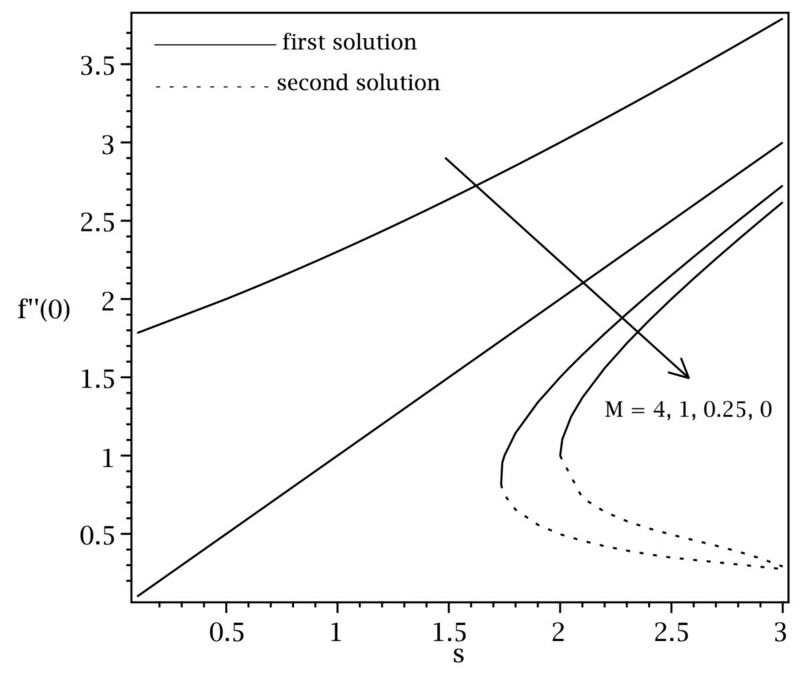 Variation of the skin friction coefficient for different values of β when M = 0.25 . The variations of the skin friction coefficients with the suction parameter for β = 0.5 , 1.0 and 1.5 are displayed in Figures 2, 3 and 4, respectively. The skin friction coefficients increase with both the magnetic parameter and the suction parameter. Figures 2 to 4 also show the existence of the dual solutions. The boundary layer separates from the surface at s = s c , and beyond this value, the boundary layer approximation is no longer valid. Therefore, the full Navier-Stokes equation need to be used. Normally, the first solutions are physically stable and this can be verified by performing a stability analysis; see Merkin  and Weidman et al.. In Figures 2 to 4, it is found that s c increases with M. Therefore, we can conclude that the magnetic parameter delays the boundary layer separation from the surface. Variation of the skin friction coefficient for different values of M when β = 0.5 . Variation of the skin friction coefficient for different values of M when β = 1.0 . Variation of the skin friction coefficient for different values of M when β = 1.5 . Figures 5 and 6 illustrate the dual velocity profiles for various β and M, respectively, with both figures satisfying the boundary conditions (7). This is to prove the dual nature of the present problem. 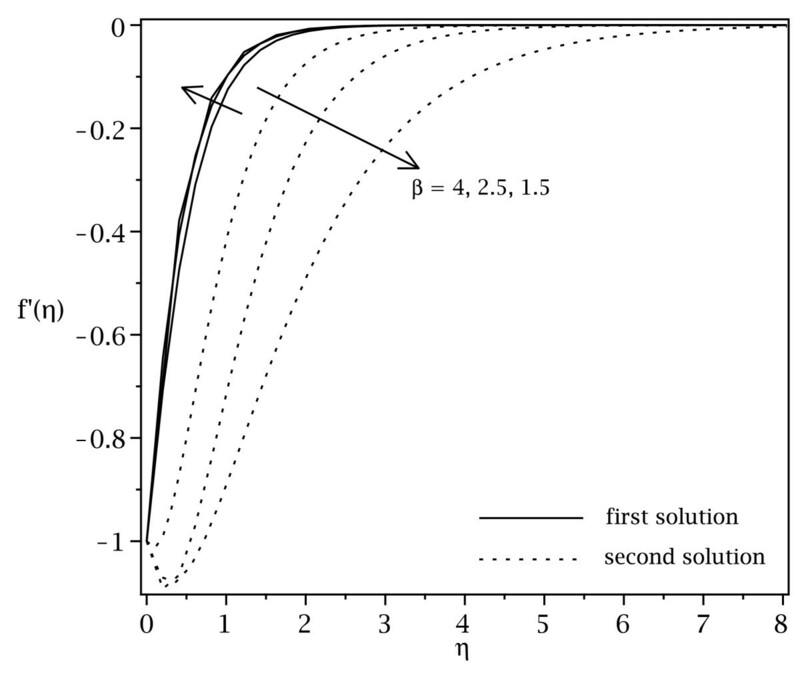 From Figure 5, the boundary layer thickness increases with β. 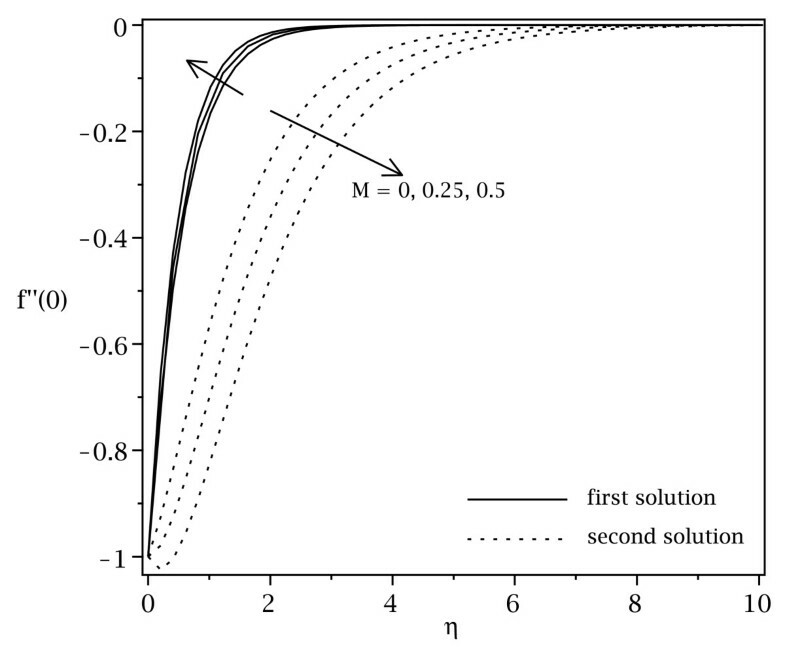 However, the boundary layer thickness decreases as M increases, as displayed in Figure 6. This phenomenon is due to the fact that M creates the Lorentz force which slows down the fluid flow, hence reducing the boundary layer thickness. Velocity profiles for different values of β when M = 0.25 and s = 2.4 . Velocity profiles for different values of M when β = 1.5 and s = 2.4 . A study is performed for the problem of MHD flow of a viscous fluid on a nonlinear porous shrinking sheet. It is observed that the dual solutions existed only for positive values of the controlling parameter. In this study, we can conclude that the controlling parameter accelerated the boundary layer separation, however, the magnetic parameter delayed the boundary layer separation. The authors gratefully acknowledged the financial support received in the form of a FRGS research grant and a LRGS research grant (LRGS/TD/2011/UKM/ICT/03/02) from the Ministry of Higher Education, Malaysia, and DIP-2012-31 from the Universiti Kebangsaan Malaysia. All authors have contributed their parts equally and have also read and approved the final manuscript.